I am glad to write the foreword for the timely book titled Light-harvesting Nanomaterials edited by Dr. Surya Prakash Singh. I believe this book is a mine of information for those who are pursuing work/research in this array. As fossil fuels are becoming more scarce, research on the development of various approaches to utilize renewable energy sources such as solar energy, wind and hydrogen is gaining importance. Natural photosynthesis executes efficient light-harvesting by continuous unidirectional electron transfer between chromophores is magnificent aspect of nature’s light harvesting of solar energy has motivated researchers to mimic such a process. The science of light harvesting materials is experiencing remarkable growth. Till now conventional solid-state junction devices commanded photovoltaics, which are often made of silicon. Owing to the cheap fabrication and flexibility various light harvesting materials such as nanocrystalline materials, conducting polymer films and organic photoelectronic devices have emerged as alternatives. Nanocrystalline materials provide possibilities of improved performance. Photosensitization of wide-band-gap semiconductors such as TiO2 by adsorbed dyes have enabled practical for solar cell applications. 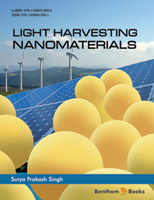 This book dealing with light harvesting nanomaterials should be of use in this interest. In the search of, renewable and clean energy, the solar cell is considered a major candidate for obtaining energy from the sun. To capture the energy of entire solar spectrum is the main challenge to improve the performance of photovoltaic devices. Incorporation of nanomaterials as a light harvester made a revolutionary change in the field of solar cell technology to both enhance efficiency and lower total cost. First and foremost advantage of nanomaterials is tunable band offset and visible response with size quantization, which allow us to harvest desired portion of solar spectrum. Till date different kind of nonmaterial have been tested for their light harvesting properties, such as compound semiconductor nanoparticles, quantum dots, metal nanoparticles etc. Understanding their energy transfer mechanism and charge carrier capacity are the important parameters to make it more useful for solar cell. This book summarized the present scenario and fundamentals of synthetic approaches and tailoring the light harvesting properties of a variety of nanostructured materials and their application in photovoltaic industries with a systematic and coherent picture of the field. The chapters of this book written by distinguished scientists, who are experts of their fields. We sincerely hope that this book will provide insight into subject and some new directions to material scientists as well as the new researchers.